NOOA and ETITA in the WORLD INDOOR. Following an invitation from the Organising Committee of the World Indoor Championships in Istanbul, Turkey, two athletes and a coach from Kiribati have travelled with the Oceania AA group. This appears to be an increase in participation and funding by the organisers and IAAF, since in previous years only one unqualified athlete has been accepted as an entry in this cimpetition. Thus Mr. Nooa Taakoa and Ms. Etita Tio have been entered for the 60m. 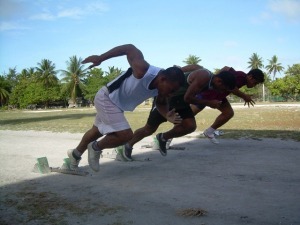 sprint, and they are accompanied by Mr. Eneree Tataio as coach. Today (March 9th.) Nooa ran in Heat 3 (of eight Heats) of the M60m. He had an unusually slow start (0.426 sec.) when he would normally expect to react 0.2 faster. (There have been reported problems with the starts in Istanbul, with some athletes missing the start and reacting to an echo !) He finished 6th. out of seven finishers in a Personal Best (PB) time of 7.57 secs. On checking the 60m. Heats, it seems that men from eleven Oceania island nations competed, but none from Australia or New Zealand. The best Oceania performance was by Roy Ravana from Fiji who set a new National Record (NR) of 7.17 secs. There were two other NRs and seven of the other athletes set new PBs. None of these men qualified for the semi-finals. Etita will run in Heat 7 (out of eight Heats) tomorrow. Today, March 10th., Etita ran in Heat 7 (of eight Heats). She had a reasonable start (0.256 sec.) and finished 7th. of the eight finishers. Her time was 9.14 secs. which is a PB and, if there is no outdoor 60m. 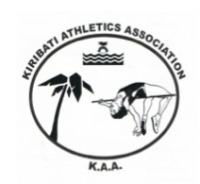 performance on record (indoor or outdoor), will be a Kiribati National Record (NR). The overall 60m. results show women from nine Oceania island nations participated (but again none from Australia or New Zealand). None of them qualified for the semi-finals. The best was by Lovelite Detenamo from Nauru in 8.04 secs., a Nauru NR. Including Etita, there were two other NRs and six PBs. Kiribati athletes training outdoors, including boys practising block starts, and one of the girls doing track work.